Cheesecake can be such a production. Springform pan, two pounds of cream cheese, water bath, accompanying toppings and/or sauces. If you want to make a tall, impressive cheesecake that serves sixteen, that’s great (and please invite me over). But I only ever want to make a simple cheesecake–something my two-person household is capable of finishing in a reasonable amount of time. Cheesecake is my favorite dessert and I won’t go through a rigmarole every time I want to make it. So I reject the idea that cheesecake must be baked in a springform pan. There are a lot of delicious cheesecake recipes, and this one certainly isn’t remarkable compared to many of those. This isn’t the cheesecake you make when you want to feed a crowd or impress people with presentation. But if you want cheesecake and nothing more, this is an excellent recipe to use. It’s simple and straightforward, and I’ve made it so often that I have the recipe memorized. This is baked in a nine-inch pie tin and serves (“serves”) eight in manageable, pie-sized wedges. It’s smooth and creamy like all cheesecake should be, and the tablespoon of vanilla ensures that there’s plenty of flavor to complement the cream cheese tang. You can always try halving a standard cheesecake recipe, of course, but some of them have odd quantities of ingredients, and some of us… are not great at halving. When my best friend Kate and I tried this approach six years ago, we had mixed results. Very mixed. 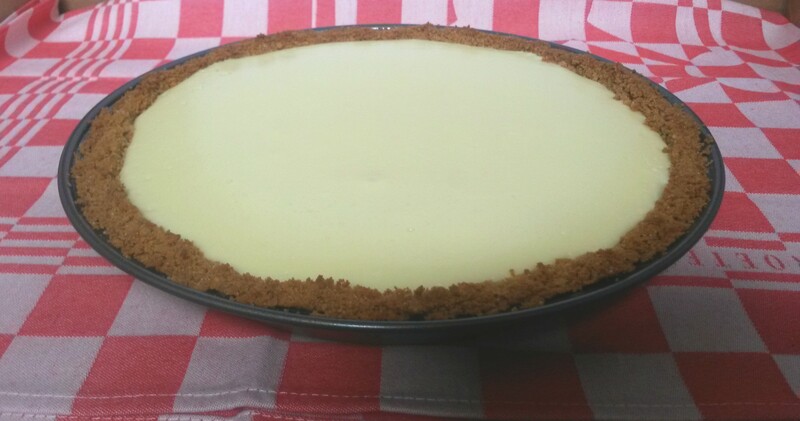 We forgot to adjust the baking time to account for the smaller quantity, so by the time we figured that out and took the cheesecake out of the oven, the crust was burnt and the filling was firm and very overdone, with a few ominous brown spots speckled on top. While carrying the cheesecake from the oven to the freezer (we were impatient), we dropped it on the floor. Determined to save it, we picked up the hot, burnt, broken cheesecake, put it back in its pan, and put the pan in the freezer. We were on a mission to eat it. When we finally tried it later that evening, it was noticeably burnt and… eggy. The recipe had called for five eggs, which made halving a bit tricky, but we chose to err on the side of three eggs. While Kate and I ate the cheesecake, I commented that maybe we should have used two eggs instead of three. “And maybe we should have baked it for like an hour less,” she said. Valid point. So if you want cheesecake–but not too much–here’s a good recipe, no egg math required. I’ve been using this recipe since I found it on How To Eat a Cupcake six years ago (three months after the eggy-burnt-floor-cheesecake disaster of 2009). It’s simple and to the point, which is exactly how I like my cheesecake. 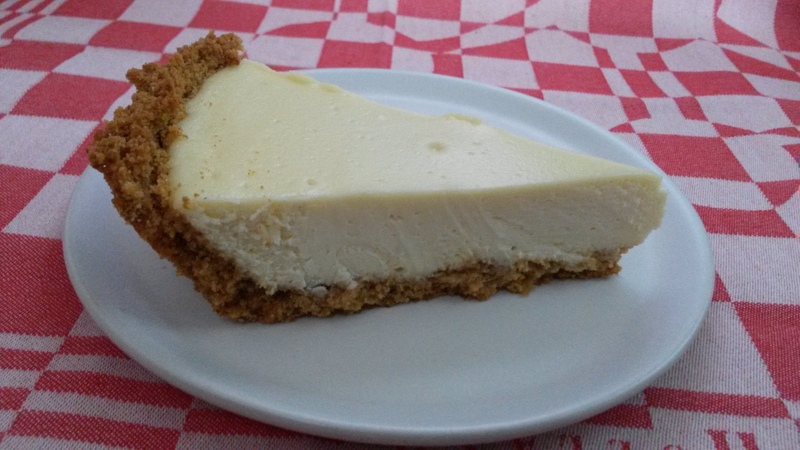 If you want your cheesecake to have a little more flair, feel free to use this basic recipe as your starting point and then add your alternative crust, mix-ins, flavors, or toppings as you please. You know how this goes. Crush your graham crackers, add melted butter and a touch of sugar, bake for 5-6 minutes. Cream together the cream cheese and sugar, beat in two eggs one at a time, add the vanilla. This is standard stuff. Somewhere along the way I came to understand the jiggle–or I thought I did. I got a little cocky this time and pulled the cheesecake out a few minutes too soon. 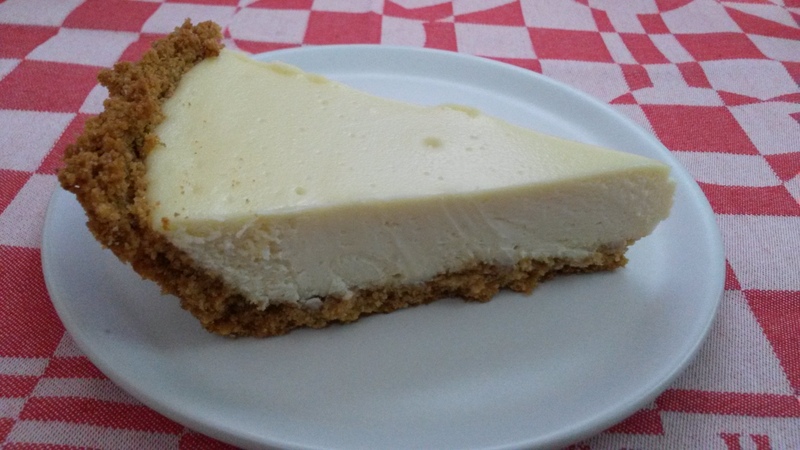 The end result was that the centermost part of the cheesecake wasn’t as firm as the rest of it–slightly wobbly, lacking that cheesecake density that the rest of it had. But it was still good, and as I ate this cheesecake over the course of several days, I found that the wobbliness firmed up after spending a few days in the fridge. So what is the ideal jiggle? 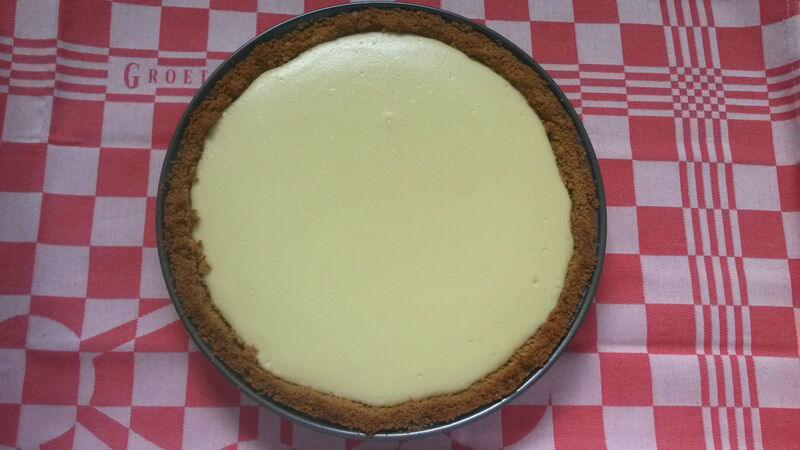 When you jostle the cheesecake to test for doneness, the center of the cheesecake should move a little, but not so much that it freely wobbles to and fro like Jell-O. Rather, it should move just enough to acknowledge your jostle–like the wobble of a cold pudding, perhaps. That’s the best I can describe it. I hope you, too, can find your ideal jiggle. For the crust: Preheat the oven to 350 degrees. Combine the graham cracker crumbs, sugar, and salt. Pour the melted butter over the mixture and stir with a fork until the crumbs are coated evenly. 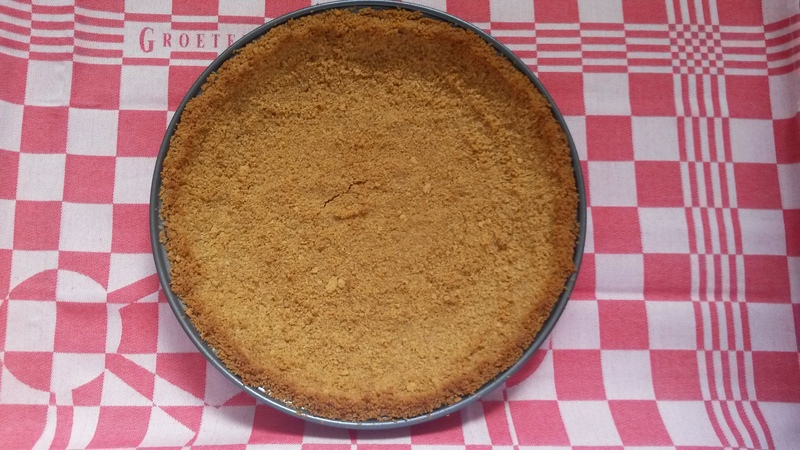 Use your fingertips to press the crumbs into the bottom and sides of a 9-inch pie dish. Bake the crust for about 5-7 minutes or until lightly browned. Let the crust cool on a cooling rack while you prepare your filling. For the filling: Lower the oven temperature to 325 degrees. Cream together the cream cheese and sugar until combined. Beat in the eggs, one at a time, and then add the vanilla. Pour into the crust and bake for 20-25 minutes or until the center is just set–the center should only move a little when jostled. Depending on your oven, this may take longer than 25 minutes to achieve (it often takes me 30-35). It was excellent! 😀 Thanks for sharing.